← Is A Historic District Designation The Right Choice For Witherspoon-Jackson? This week has seen many tributes to local architect Michael Graves, who died last Thursday at the age of 80. An internationally recognized force in the post-modern architectural movement, Graves was a true legend. The local media are full of praise this week, but the reaction to Graves’s only major public building in Princeton was a lot more mixed. 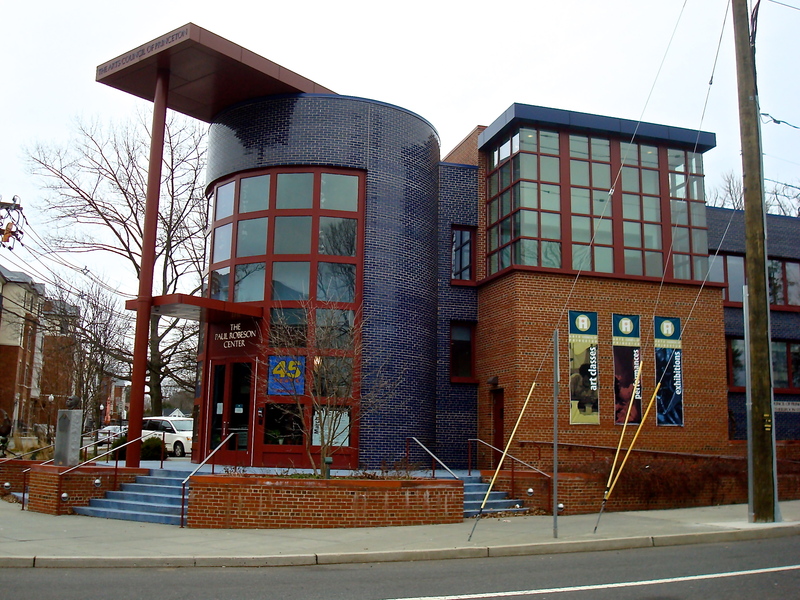 When Graves offered his services to design a new home for the Princeton Arts Council at the intersection of Paul Robeson Place and Witherspoon Street (see image above), the Planning Board returned a simple answer: “No”. It took years, multiple revisions, and significant down-sizing before the building that currently stands was approved. 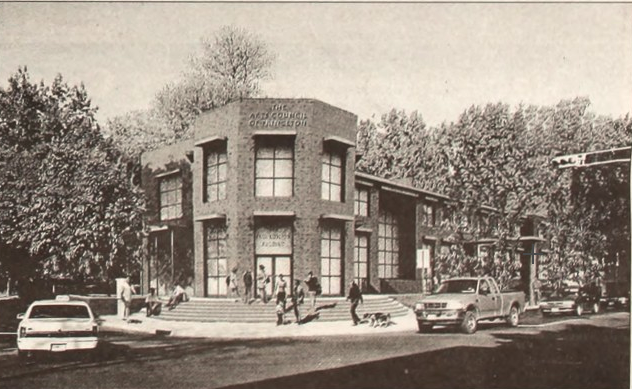 The original concept for the Arts Council building was revealed in late 1998, and included many features of the building that eventually got built: typical Graves-esque barrel-shaped structures, with blue glazed tiles. At the back, an extension would have accommodated a 200-seat theater. Michael Graves, an internationally-famous architect, could have chosen to live anywhere in the world. But he stayed up until his death in his custom-designed home, ‘The Warehouse‘, in walkable downtown Princeton. Fortunately, as the proposed building shrunk, the signature Michael Graves touches, such as the blue glazed tiles, came back into the design, giving the distinctive building that we see today. Shortly before his death, Graves listed the ‘Paul Robeson Center for the Arts’ (as the building is officially known) on his list of top buildings to see on a walking tour of Princeton. Over ten years later, the fractious debate that led to the construction of the Arts Council building has hardly been forgotten. If anything, redevelopment of buildings in the Witherspoon Street corridor is as controversial as ever, with the opposition to the AvalonBay project, and ogoing debate over whether the local area should be designated as a historic district. It’s interesting to wonder if a Michael Graves design would ever have been built in a historic district. The post-modern design would surely have been considered unsuitable, which illustrates a risk with historic designation- it can prevent good architecture as well as bad architecture. Few people nowadays dislike the Robeson Center, or would seriously argue that it destroyed the local neighorhood. The Arts Council today is more committed than ever to serving local residents. As for the question of parking, which scuppered the original design, this was solved by the subsequent opening in 2004 of the Spring Street Garage. The garage sits half-empty most evenings, when it might have served theater-goers. It’s water under the bridge now, but it shows that when it comes to getting something built in Princeton, nobody should expect things to be easy. Even if you have Michael Graves on your team. 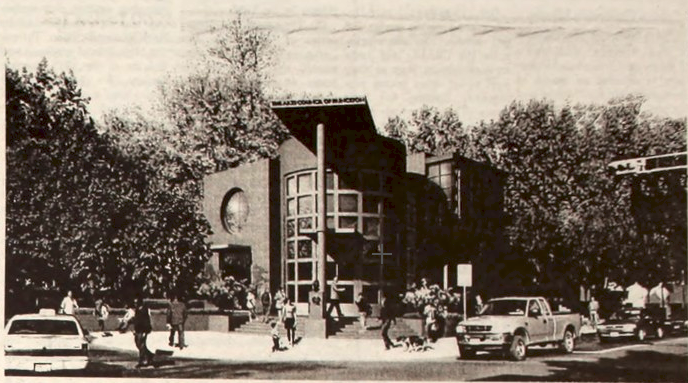 This entry was posted in architecture, Downtown Vibrancy, People, Placemaking, planning, Princeton, The Parking Question, Zoning and tagged architecture, arts, michael graves, Princeton. Bookmark the permalink.